But long before the legendary steel-and-gold Santos was launched in 1978, there was a small version of the model called the “Santos-Dumont.” And this is actually the watch that inspired the famous Santos of today. Louis Cartier created that Santos-Dumont model in 1904 for his aviator friend Alberto Santos-Dumont, who had asked for a watch that allowed his hands to remain free for controls while flying. On November 12, 1906, he became the first person to be filmed in an airplane in flight when he flew 220 meters in 21.5 seconds – wearing what may well be the first pilot’s wristwatch in history. For seven years, Alberto Santos-Dumont had the privilege of being the only one to wear this model as the Santos-Dumont was not officially available to the public until 1911. And when the Santos-Dumont finally arrived in the Paris store, it was offered in several different model variations, all made in platinum or yellow gold and all in a fairly small (by today’s standards) case measuring from about 24.8 x 34.8 mm. The mechanical movements were in general supplied by EWC (European Watch & Clock Co./Jaeger-LeCoultre). At that time, the majority of Tank and Santos watches were delivered on a light brown or black pigskin leather strap with a gold folding buckle and they were more or less always available in the Cartier collection in one shape or another. Aside from the fact that the Santos-Dumont was the first pilot’s watch, the deployant buckle that Cartier developed in 1909 was another first: for many years it was the only folding buckle on the market. Belatedly celebrating the ninetieth anniversary of the Santos-Dumont, in 1996 Cartier launched 90 watches in platinum with a salmon-colored dial, Breguet-style hands, and a white gold folding buckle. The case of the 90th anniversary Santos-Dumont was slightly larger than that of the original models, but still not more than 36 x 27 mm. The movement, a hand-wound caliber by Frédéric Piguet, kept the case really slim. Until now, the ninetieth-anniversary version has been one of the best-looking Santos-Dumont models ever made. The watch, in high demand among collectors, also because of the preferred Breguet-style hands, is very hard to find. 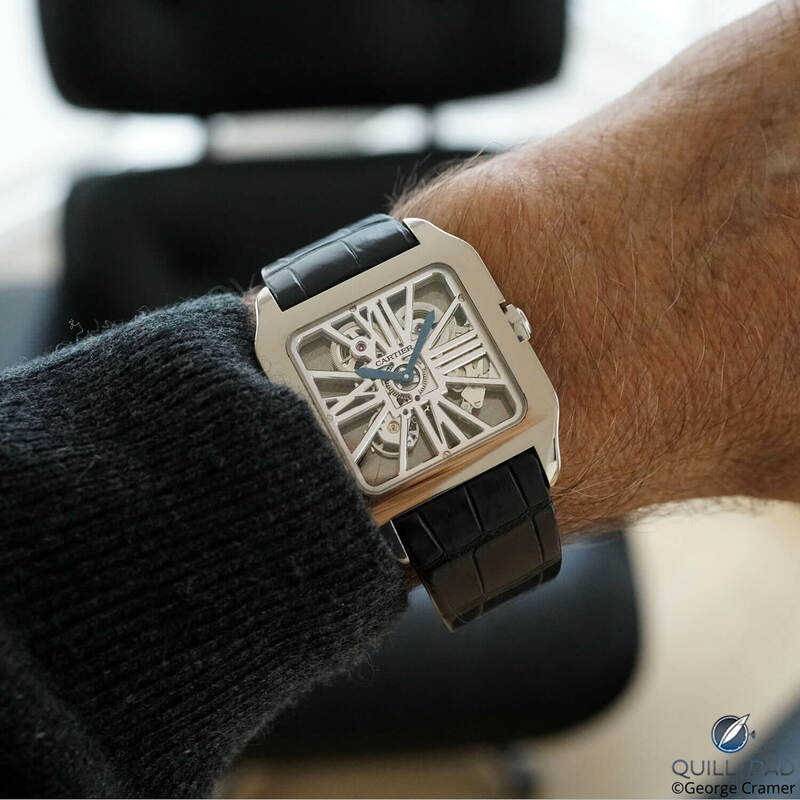 In 1998, Cartier introduced Collection Privée Cartier Paris, a line featuring many historical models outfitted with high-end manufacture calibers by well known movement makers. Two new Santos-Dumont models were launched at this time, illustrating its importance at Cartier. The 1998 model is still one of the most common Santos-Dumont models, housed in a 36 x 27 mm platinum or yellow gold case and powered by a Frédéric Piguet movement. But when the production of Collection Privée Cartier Paris watches ended, these small Santos-Dumont watches also stopped being made. Cartier came out with a great re-issue in 2004 called the Santos-Dumont 1913 featuring a faceted crystal, Breguet-style hands, and a mechanical caliber. It was a limited edition of just 100 pieces in yellow gold and one in platinum. This watch’s case size was a tad smaller than the non-limited version released in 1998. A new, larger model was released in 2005, one that was not part of the Collection Privée Cartier Paris line and the first Santos-Dumont model with what’s known as a TV-shaped case (slightly elongated). This was a very different Santos-Dumont, powered by a mechanical caliber by Piaget and without the signature bezel screws that marked all the previous models. This was a chic and very flat watch with an extremely clean look that works great with formal wear. The latest Santos-Dumont model was the skeletonized version released in white gold in 2011, followed up by a titanium model with ADLC coating and various gold versions. Its skeleton caliber looked very different from what was until that time normally seen as a skeleton thanks to its architectural appearance. And even though Cartier had already used Caliber 9611 MC for the first time in a Santos 100, the real breakthrough for this movement came with its use in the Santos-Dumont. These three Santos-Dumont models are still in the current collection. The Santos-Dumont was not only the base model for all these variations, it was the role model for the most copied watch in the world, the sporty steel Santos with gold bezel and screws that was re-released in 2018 (see Santos de Cartier 2018: One Of The World’s First Men’s Wristwatches Reinvented). Almost all Santos-Dumont models have had that same recognizable square case outfitted with signature screws on the bezel, Roman numerals, and blued hands. The current collection, however, is based on the model with the smoother appearance, without the bezel screws. If there is one watch, that fits a man with taste – even if he is not really a Cartier man – it is a Santos-Dumont. Its discreet appearance makes it an ideal dress watch and its non-round case makes the watch just a little more daring than the flat round dress watches we commonly see.